Prime Ark Freedom is the first thornless primocane fruiting blackberry in the world! A blackberry usually grows one year and doesn't fruit until the following season. Freedom fruits this way very early in the season, but then fruits again in the fall where the climate is suitable. Freedom also has exceptional extra large fruit size, good flavor and the plant grows upright and needs little or no staking. Zones 5-9, space 5' circle or 5' apart. 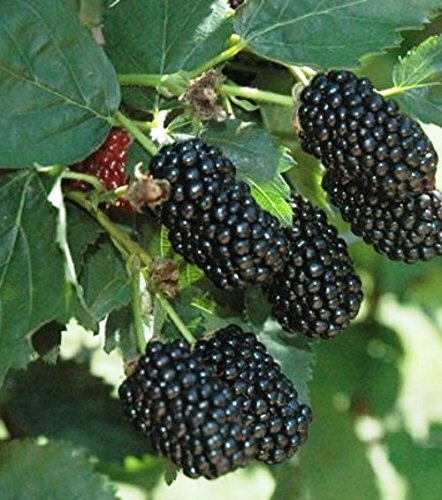 The price includes Four (4) "Prime-Ark Freedom" Blackberry Plants. They are 2 inch rooted plants shipped in 2 inch tray pots and are 3-6 inches tall. Prime Ark Freedom is the first thornless primocane fruiting blackberry in the world! A blackberry usually grows one year and doesn't fruit until the following season. Freedom fruits this way very early in the season, but then fruits again in the fall where the climate is suitable. Recommend to start off in a 4 inch pot with Organic Potting Soil like Fox Farm Happy Frog with fertilizer and beneficials already mixed in.